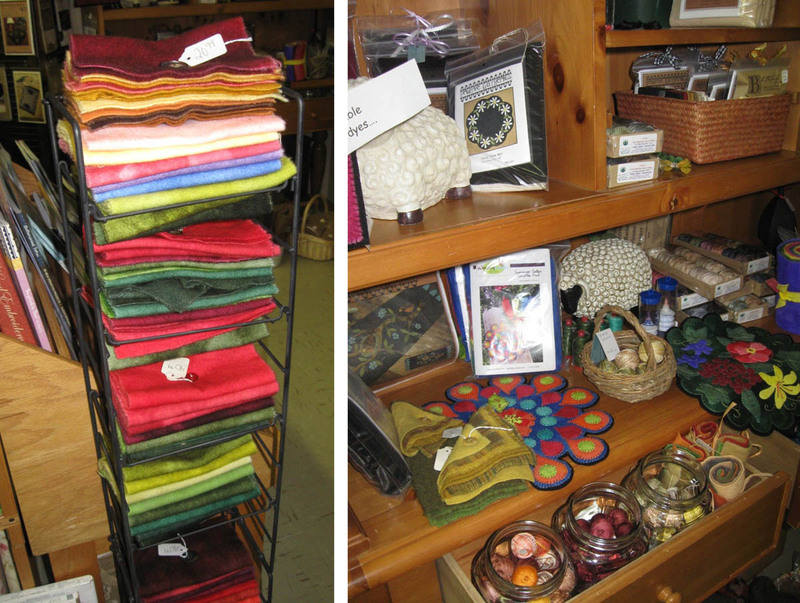 Don't you just want to submerge your fingers between these luscious little bundles of color? 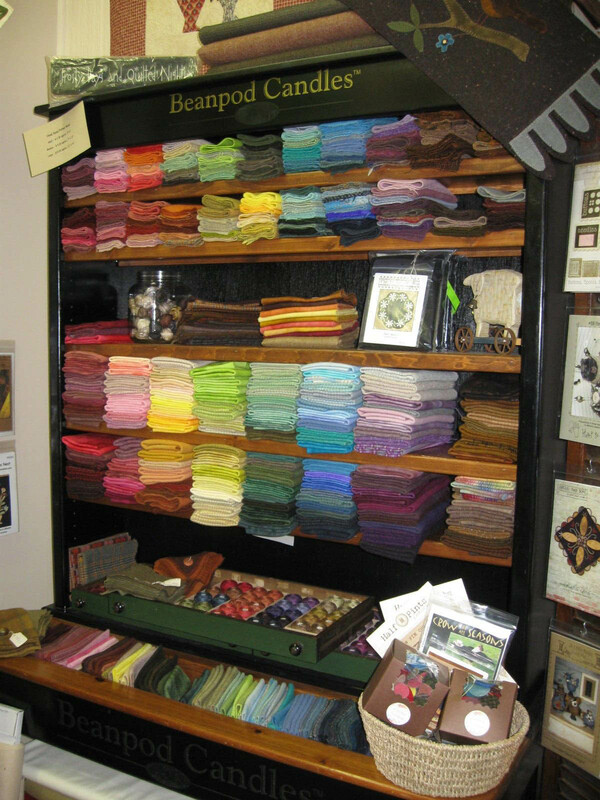 You'll find these hand-dyed wools, hand-dyed threads, perle cottons, and stitching embellishments among the fabrics and quilting notions at Mountain Creek Quilt Shop in Greenback, Tennessee. Professional long-arm quilter, Terri Ayers, opened Mountain Creek Quilt Shop almost 3 years ago and caters to traditional and modern quilters, and hand stitchers and embroiderers with her selection of fabrics, threads, quilting notions and unique stitching accoutrements. 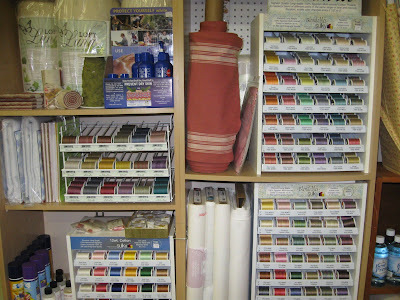 Terri offers a wide selection of neutrals and blenders in warm and cool hues that can be used for backgrounds for hand stitching projects or to coordinate with focal prints such as large and medium scale florals, whimsical prints, and traditional fabrics such as Civil War and other reproductions. 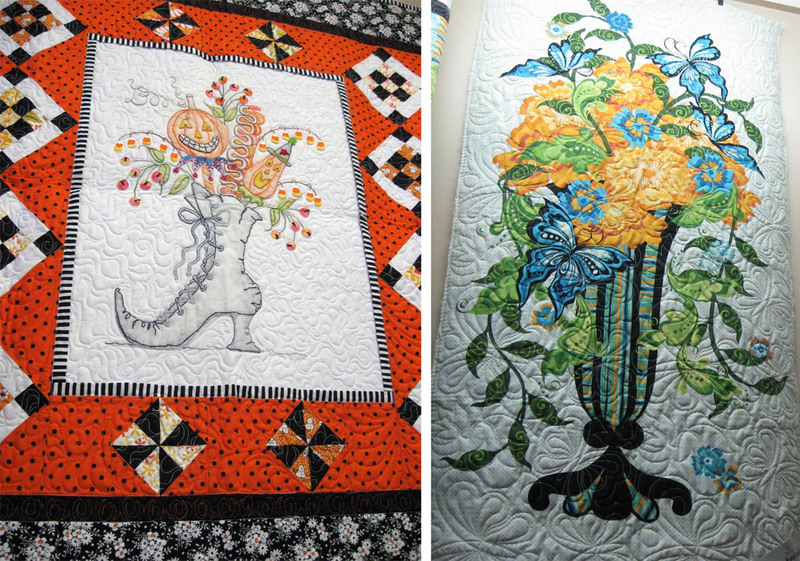 large floral prints and whimsical dots and stripes. The high ceilings of the shop provide expansive wall space on which quilts are hung. 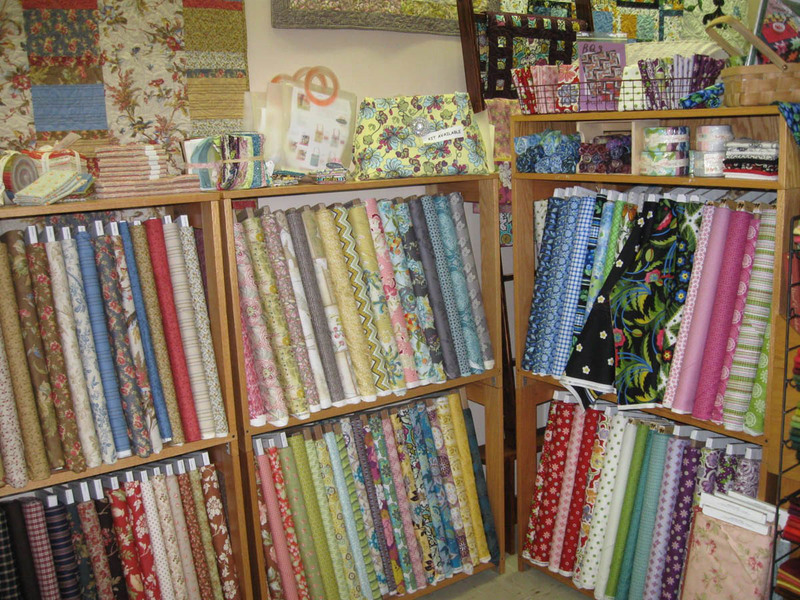 The quilts add to the charming and welcoming ambiance of the shop and serve as examples of what can be done with the various fabrics, notions and embellishments available at Mountain Creek Quilt Shop. 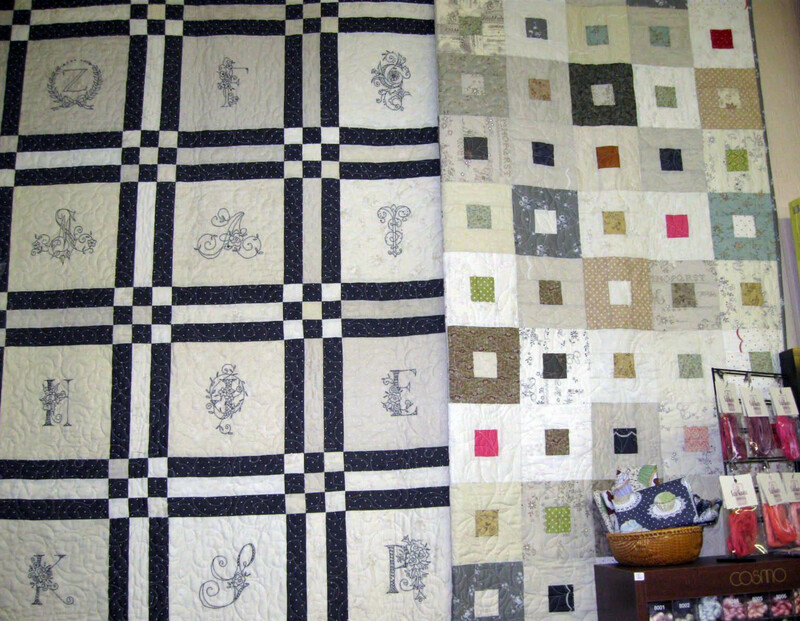 A mix of prints, stripes, dots and blender fabrics. 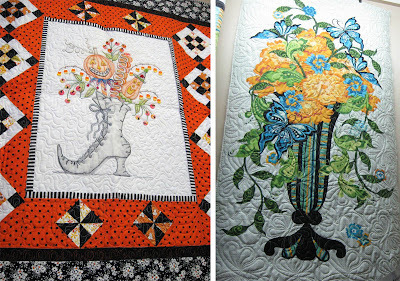 You can also see Terri's magnificent machine quilting on many of the samples hanging throughout the shop. 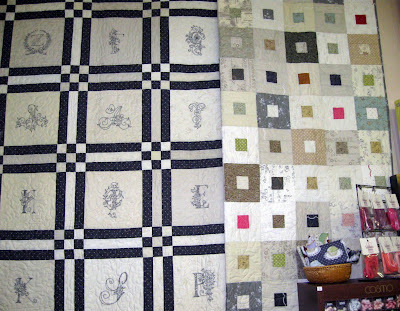 beside a quilt that boasts a neutral pallet and scattered with small colored center squares. 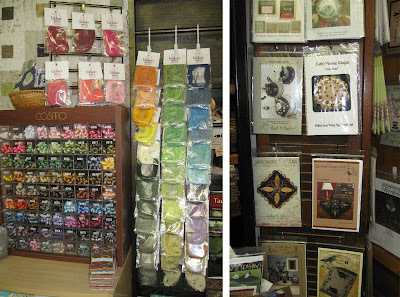 As you enter the front room of the store, there is a unique collection of embroidery floss, perle cotton, hand-dyed threads by Weeks Dye Works, fabric covered buttons and embellishments. 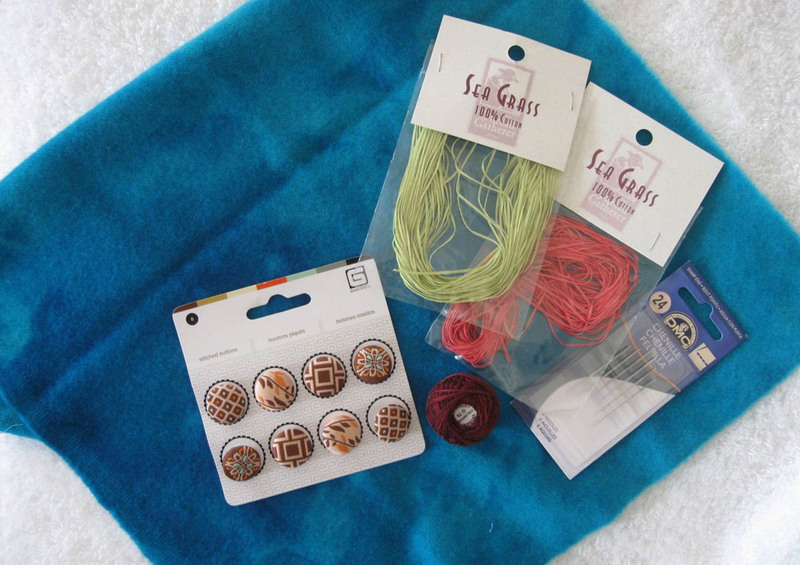 Embroider floss, Sea Grass and patterns for wool projects. Hand dyed threads from Weeks Dye Works. Beautiful hand dyed wools, that Terri dyes herself, are available in a wide, rich color spectrum. The patterns, books, kits and samples that are also on display beckon you to give hand needlework a try! The shop also has on-going classes that offer a variety of projects for beginners and experienced needleworkers and quilters alike. 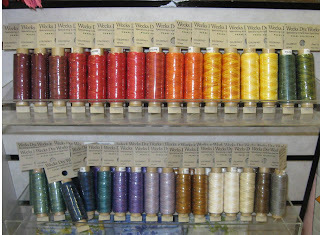 Hand dyed wools, penny rugs, kits and jars full of perle cotton embroidery threads. 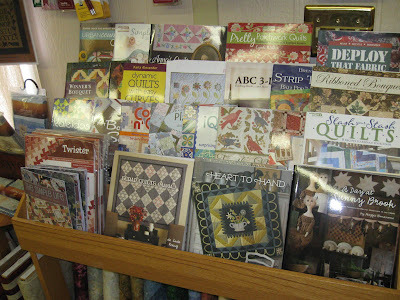 A selection of books for quilting and needlework projects. Wool penny rugs, hand embroidered primitives, and various wool stitcheries hang throughout the shop and are tucked into cubbies and cupboards to provide a wealth of ideas and inspriation. 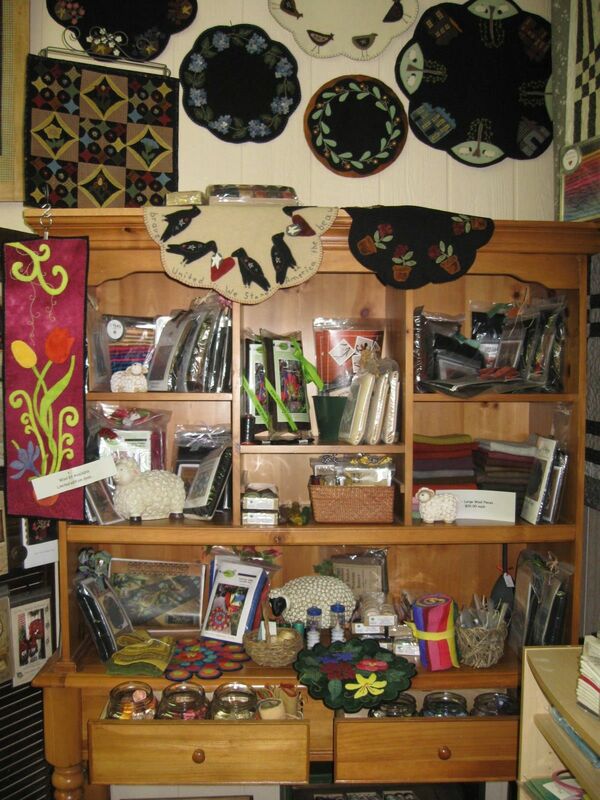 A wooden cupboard displays wool projects, kits and drawers of embroidery threads. I'm going to try hand embroidery with Sea Grass thread on hand-dyed wool. 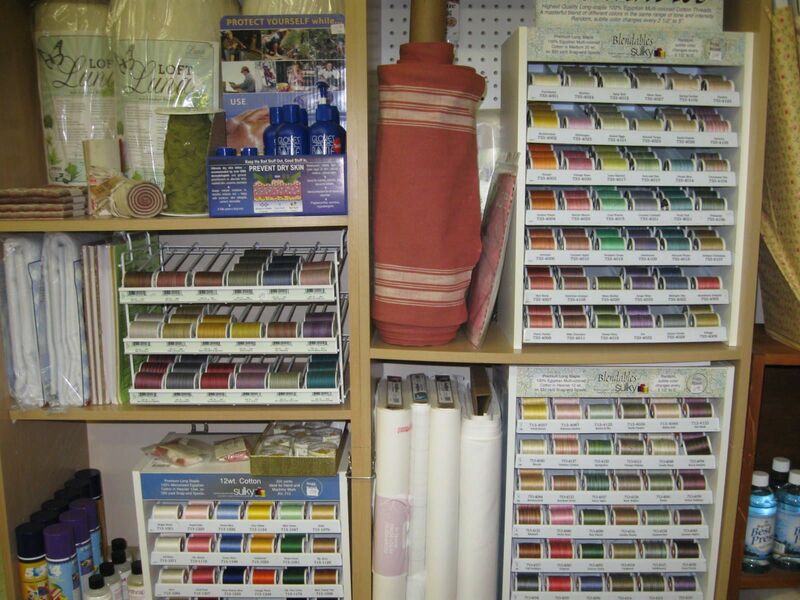 A full range of quilting supplies, thread, batting and stabilizers rounds out the offerings. 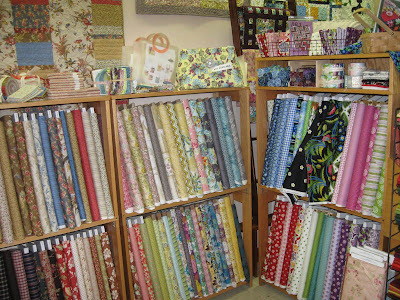 Quilting notions, thread and batting. Mountain Creek Quilt Shop, Greenback, Tennessee. 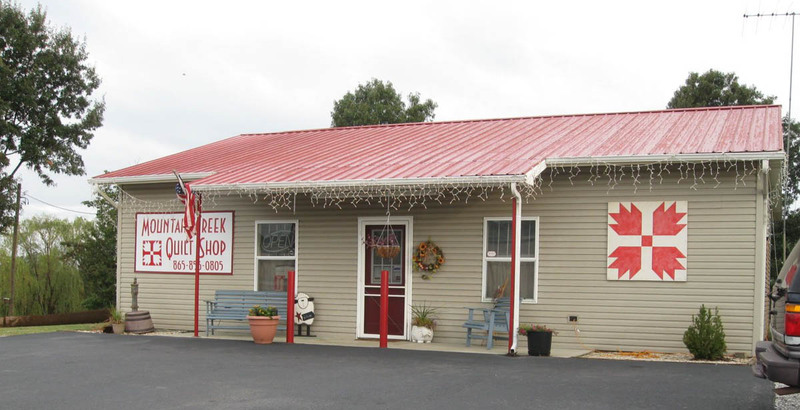 So, does Greenback sound familiar to you? 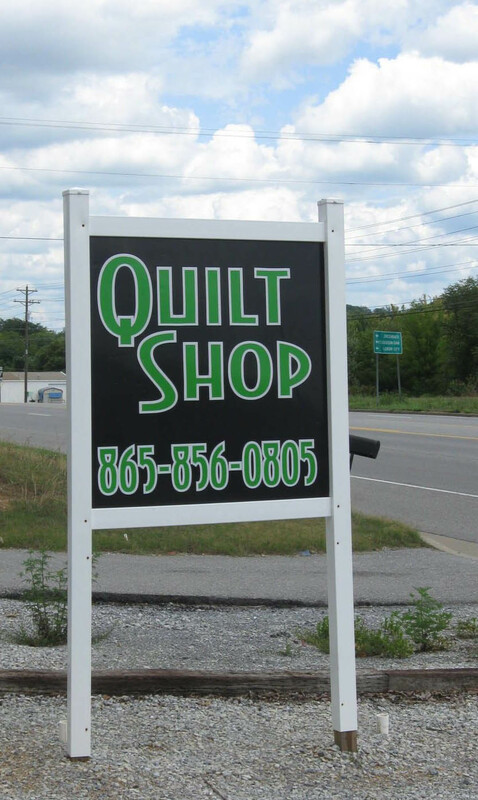 This town and several of the local businesses, along with Terri and her quilt shop, were featured in an H&R Block commercial in 2010. See it here on YouTube and watch Terri's expression when she opens the tax refund envelope. It's priceless! 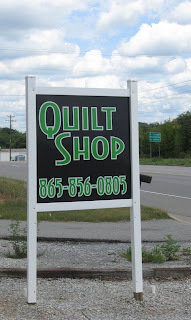 Plan a visit to the Mountain Creek Quilt Shop in east Tennessee and you will be just as pleased with the quilting and needlework possibilities you'll find inside. 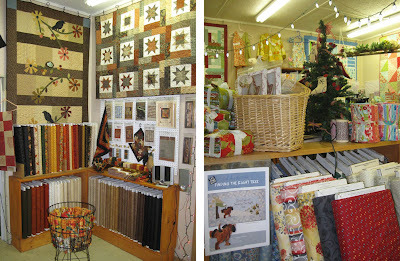 Tell Terri you saw her shop on the YouTube video and here at FiberAntics.